Another wonderful meal made out of just vegetables. I love the layering technique since you are able to jam so many flavors into one little bite. I also included a lot of ingredients because I was skeptical about the kale. I’ve been trying to get into it and am not a fan of raw kale. Cooked, however, tastes divine! Saute it with some olive oil, garlic, and onions, and this is easily one of my new favorite vegetables! I’ve also been working on my plating skills. I’m not professional, but I try to have fun with it! In a medium sized pan over medium heat, drizzle olive oil. Place eggplant on pan and cook each side for 4 minutes. Remove from pan and set aside. In the same pan, drizzle olive oil, add garlic and onions. Add in kale. Saute for 5 minutes or until kale is cooked through. Remove from pan and set aside. 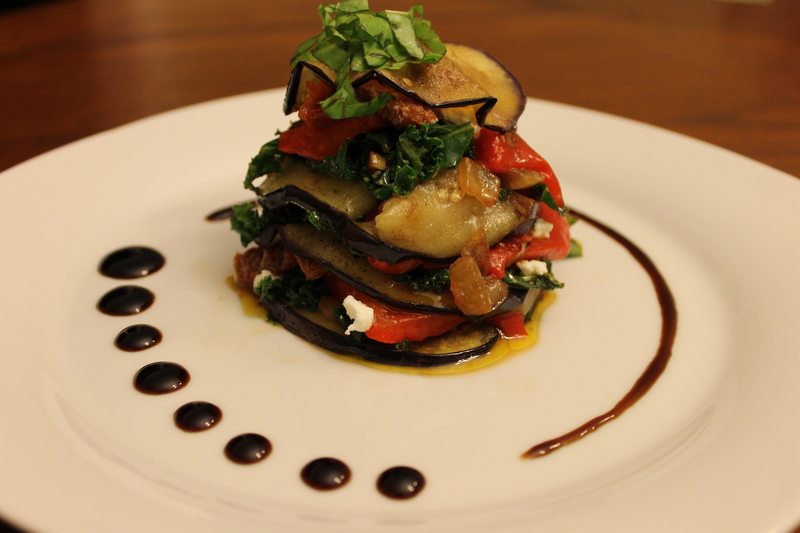 Place one slice of eggplant on the plate, then a layer of kale, roasted red peppers, sundried tomatoes, and goat cheese. Repeat until all ingredients are used up. Top with chopped basil.